Oaks and other trees surround the capitol building, creating a wonderful green space. Have you ever wondered about the big trees in Madison, Wisconsin? Towering oaks with gnarled branches and thick trunks are scattered throughout the city. If you think these trees are unusual, you are correct. Some of them are hundreds of years old and have witnessed many generations and historical events. These old oaks are also significant because they are the last remnants of the oak savannas that used to cover southern Wisconsin. This is a successful oak savanna restoration project in Minnesota implemented by Prairie Restorations, Inc.
Southern Wisconsin looked very different 200 years ago. Today, when we drive around Dane County, we see forest patches in between farms and towns. Before European settlement, however, this area was a landscape of vast prairies with oak trees here and there. Treeless prairies and oak savannas are found in dry, sunny regions, and they used to cover millions of acres of land across the Midwest. These plant communities are fire-adapted: they rely on yearly low-intensity wildfires to burn up dead grasses, fertilize the soil, and kill most sprouting trees. Oaks have deep roots and thick bark that enable them to be the lone survivors of such fires. Grown in open savannas without competition from other trees, oak trees can stretch their limbs wide, forming the classic oak silhouette. Here’s a typical low-intensity prescribed burn in a bur oak savanna. In the 1800s, settlers turned southern Wisconsin’s flat, fertile prairies into farms while suppressing wildfires to protect their crops and towns. In the absence of fire, trees like Red Maples eventually took over former oak savannas. Oaks don’t compete well in thick forests because other tree species are more effective at accessing water, soil nutrients, and sunlight. A healthy old oak tree in a residential area. Today, conservation groups like The Nature Conservancy try to promote oak savannas because they offer unique habitat for rare songbirds and because their acorns feed a variety of small mammals. Conservationists use controlled fires to burn off competing tree species to make room for oaks to grow. The savannas in the UW Arboretum and Picnic Point are great examples of such efforts. Unfortunately, it’s more difficult to support young oaks in urban areas where fire isn’t an option. The big oaks around Madison are slowly succumbing to age, disease, and storm damage. If you have oaks in your yard, make sure to give them the TLC they need. We strongly recommend careful pruning and inspection for decay pockets. Do you have space for a new tree, or are you looking to replace a fallen one? There are lots of great planting options. 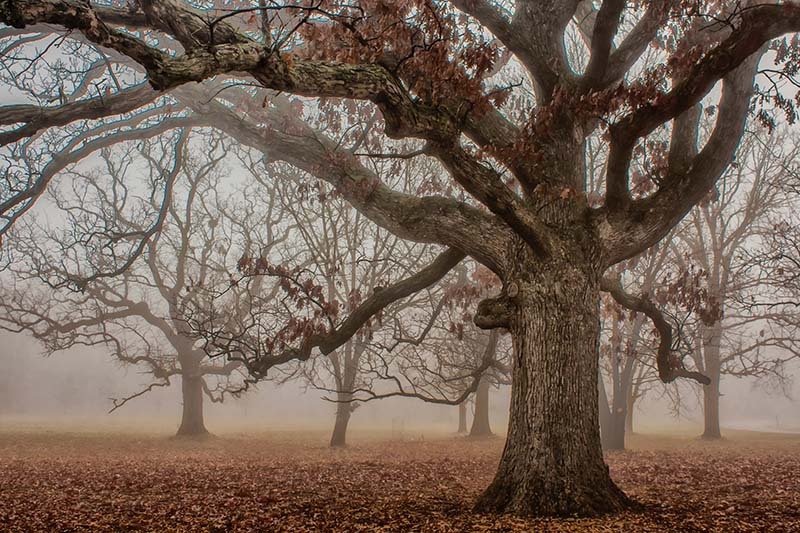 Burr oak, white oak, pin oak, red oak, swamp white oak, and regal prince oak are attractive trees that can grow into majestic giants with the right care. At Heartwood, we’re passionate about helping you through all steps of the process, from safe removal of old trees to new planting, aerial inspection, and conservative pruning. We love old oaks, and we want to help you maintain these trees in your landscape for years to come. Contact us if you need help with your trees or if you simply have questions!